This report reflects the collaborative effort of a unique group. The Brookings-Duke Immigration Policy Roundtable is a disparate gathering of twenty individuals with different experiences and perspectives: think tank analysts, political and policy entrepreneurs, community leaders, former government officials, and academics from various disciplines. The group’s distinctive feature is that its members see immigration from divergent, even conflicting perspectives. Indeed, the range of views represented in our Roundtable is unprecedented in recent immigration policymaking. Gary Burtless, Economic Studies Program, The Brookings Institution Francis Fukuyama, The Paul H. Nitze School of Advanced International Studies, Johns Hopkins University William Galston, Governance Studies Program, The Brookings Institution James Gimpel, Department of Government and Politics, University of Maryland Jennifer Hunt, Department of Economics, McGill University Howard Husock, Manhattan Institute for Policy Research Christopher Jencks, Kennedy School of Government, Harvard University Robert Leiken, Immigration and National Security Program, The Nixon Center Will Marshall, Progressive Policy Institute Ruth Milkman, Department of Sociology, University of California, Los Angeles Noah Pickus, Kenan Institute for Ethics, Duke University Juan Rangel, United Neighborhood Organization (UNO) Daryl Michael Scott, Department of History, Howard University Christine Sierra, Department of Political Science, University of New Mexico Audrey Singer, Metropolitan Policy Program, The Brookings Institution Peter Skerry, Department of Political Science, Boston College Michael Teitelbaum, Alfred P. Sloan Foundation Stephan Thernstrom, Department of History, Harvard University Johnny N. Williams, Immigration and Naturalization Service (Retired) Michele Wucker, World Policy Institute The signatories to this report are all members of the Brookings-Duke Immigration Policy Roundtable. For purposes of identification, the affiliation of each signatory is listed. The views expressed are those of the individuals involved and should not be interpreted as representing the views of their respective institutions. 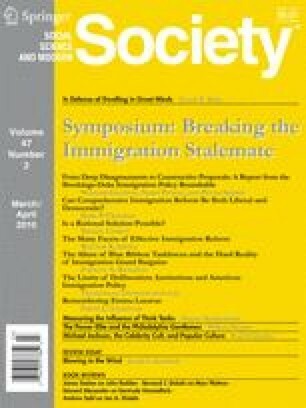 The Brookings-Duke Immigration Policy Roundtable is a joint undertaking of the Kenan Institute for Ethics at Duke University (KIE) and the Governance Studies Program at the Brookings Institution. We are especially grateful for the superb support provided by Doris Jordan at KIE and Korin Davis at Brookings. We are also grateful for the contributions of Dana Hall, Kim Abels, Aimee Rodriguez, and Stacey Meyers at KIE and John Seo, Ellen Higgins, Bethany Hase, and Christine Jacobs at Brookings. Devin Fernandes and Jess Castle ably served as rapporteurs and researchers throughout the process, and we are very much in their debt. We would also like to thank Neil and Victoria Weisfeld for their shrewd and constructive editing of this report. For financial support we are indebted to the Stuart Family Foundation, the Smith Richardson Foundation, the Annie E. Casey Foundation, the James Madison Foundation, the United Neighborhood Organization (UNO), Sean and Cecilia Fieler, and at Boston College the Winston Center for Leadership and Ethics, the Institute for the Liberal Arts, and the College of Arts and Sciences. We thank them for their support but acknowledge that the findings and conclusions presented in this report are those of the authors alone, and do not necessarily reflect the opinions of these organizations and individuals. We received timely, insightful advice and analysis from a number of individuals who were not regular participants with the Roundtable. While we did not always heed their counsel, and they bear no responsibility for the opinions expressed in this report, their comments shaped our deliberations. Mark Ribbing, in particular, was a critical resource and thoughtful commentator. Lindsay Lowell, Steven Camarota, Ray Marshall, and Jeffrey Passel were also especially helpful. In addition, we thank Edward Alden, Robert Asahina, Jeanne Batalova, David Blankenhorn, Raina Blankenhorn, Eric Bord, William Corbett, Mariano-Florentino Cuéllar, George Fishman, Gary Freeman, William Frey, David Frum, Mark Goldberg, Héctor Cordero-Guzmán, Ron Haskins, Ron Hira, Michael Hoefer, Ana Iparraguirre, Richard Keeley, Janice Kephart, Mark Krikorian, Steven Lagerfeld, Irene Lee, Mark Lopez, Patrick Maney, Tom Mann, David Martin, Phil Martin, Andrés Martinez, Larry Mead, Shep Melnick, John Mollenkopf, Tyler Moran, Hiroshi Motomura, David Quigley, Sam Quinones, Marc Rosenblum, Suzanne Shanahan, Frank Sharry, Bill Tegeler, Steven Teles, Jessica Vaughan, Patrick Weil, Darrell West, and David Winston.